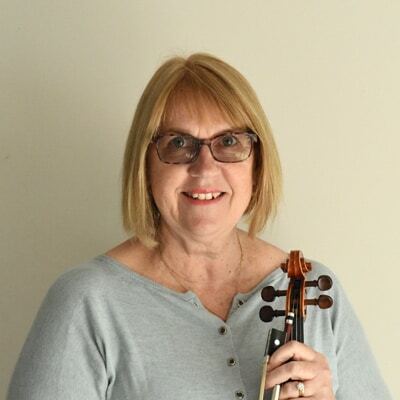 Sally became immersed in the art of making music as a small child and went on to study piano with the late Nancy Carran, flute with Uwe and Mary Grodd, violin with Martin Prokopetz, Dawn Oaten and Dr John Thomson, and is currently studying cello with Lissa Cowie. Sally has been a member of the Nelson Symphony Orchestra for thirty plus years, and has played in numerous chamber groups, church worship bands and ensembles throughout Nelson, playing many different kinds of music. Sally is passionate about music education and believes very strongly that learning and playing an instrument should be made possible for everyone. Sally enjoys teaching all ages from tiny tots to seniors and believes that anyone can learn if they have a desire to. Although classical music is her first love, she also enjoys many other genres and hopes to bring inspiration, enthusiasm, delight and a desire to learn more each day to all of her students. She loves helping students grow in their violin journey and setting them on a path to a lifelong treasured experience. Sally believes in having a nurturing and fulfilling environment, bringing a sense of joy and accomplishment for the student to each lesson.